Our online project management services make collaboration easy. We use leading technologies to expedite your workflow and enhance your team’s communication. Even complex projects with the most insurmountable number of details will be no match for your team’s ultra-efficient workflow. We’ll provide your team with all the tools you need to manage, divide, and conquer. We create an online work site to house all the documents and information pertaining to your event. Everyone on your team will have 24/7 access to the work site, with the ability to add, remove, or update information at any time and place. Our work sites use integrated Google technology so that you can easily view and upload documents on the go. GoGather customizes the work site to match your company’s branding. We also frequently create secure backups of your site so that you’ll never lose any of your documents, and so you’ll have access to multiple versions of a document—just in case your team has to go back to an earlier drawing board. Our work sites ensure that no one on your team will miss a memo, and that everyone will be completely in the loop about event updates. This is collaboration in the digital age. The days of sending documents back and forth over email—and waiting for responses—are over. Our all-encompassing online work sites allow seamless document sharing between collaborators. Your team will be able to knock out projects faster than ever. 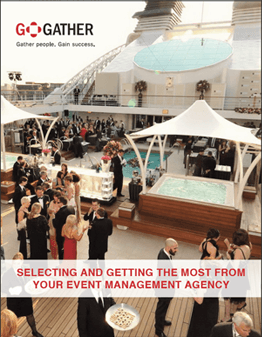 I can trust that our event management is in good hands with GoGather. They have a detailed online project management schedule for every event that my team and I can access 24/7. Our project manager also communicates with us actively through monthly conference calls, weekly emails, one-page event briefs, daily show updates and a rolling inventory report for our collateral and giveaway materials. I didn’t have to worry about the budget. GoGather took that off my plate.